There are two ways to exit the complex where we live in a cute little townhome. For the past week, every time I turned to exit one way, my two year old backseat driver says “No, mommy, I want to go THAT way” and points behind us in the opposite direction. It’s getting annoying. I just want to say, ‘Timothy, I know where we are going better than you do and I am going to get you there in the fastest possible way” – because usually we are going to the park or something that will be fun for him. And that got me thinking about a conversation I had with God recently. How I like to pretend I know the best possible thing for me and I try to tell God what should happen in my life. And he told me, “Allison: when have you put your life in my hands and I haven’t taken care of you?” And I started thinking about every major decision I had let God help me decide: my major and choice of college, my job in youth ministry and moving to Colorado, my husband, my kids. And this whole time he HAS taken care of me! I’ve had an amazing life so far. But so many times, like Timothy, I try to tell him I want to go in the opposite direction. I need to remember that as my heavenly Father, he has my best interest in mind. So my goal this week is to let God drive and I will put my trust in Him. I’m not very good at being consistent…about anything, really. When I am pregnant and nursing I don’t even take my prenatal vitamin every day (shh don’t tell my doctor). I mean to, but sometimes I just forget. So for Lent one of my goals was to say a morning offering before I got out of bed every morning to start my day off right. But I kept forgetting, when the baby woke up crying or the toddler ran into my room screaming “I NEED BREAKFAST!!!”. So I started thinking, what is something I do EVERY day that I can connect this morning offering to? The answer was coffee. I’m pretty consistent about drinking coffee every morning. 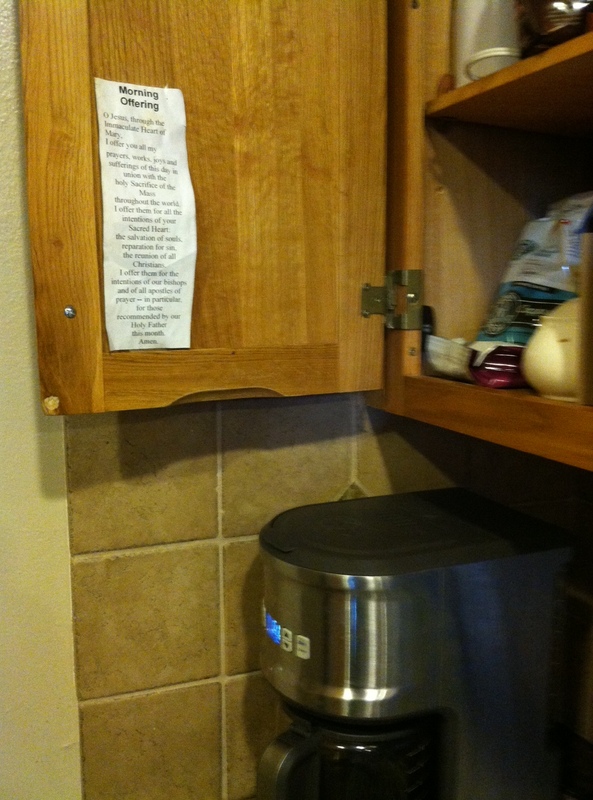 So I stuck the morning offering up in the cabinet where I get the coffee and filters. I still don’t remember every day (sometimes the husband makes the coffee) but I’m doing better than before. I’d love to know: what are things that YOU do to bring prayer into your day? You can share in the comments below. Now I better go take my vitamin while I’m thinking about it! I learned something about intercessory prayer last weekend. Since having children, life has been filled with a lot of loneliness. I mean, I have the kids to talk to, but when you have 2 under 2 there’s not much meaningful conversation going on. I get depressed sometimes thinking that my life has boiled down to a seemingly endless routine of laundry, dishes, meals, and diapers. But that’s when it hit me recently that my life is so much more than that! I mean, I am raising two little souls. But my daily tasks can now be offered up as intercessory prayer! They can make a difference to anyone who I want to pray for! It’s really that easy but I always forget about it. A friend told me about a friend of hers who had spent some time in the convent before ultimately getting married and having kids. She shared that motherhood actually has a lot in common with religious life. We both don’t get out much, but we both have the opportunity for intercessory prayer. To pray for family members, priests, missionaries, unborn babies, and all the other prayer requests we can think of. It makes me think of St. Therese of Lisieux who is the patroness of missionaries even though she never left the convent. But yet she has transformed thousands of lives with her little way. And if every mom in the world were praying every day for all these intentions as they offer their daily annoyances up, I think the world would be a totally different place. So join me in changing the world one diaper at a time! Through intercessory prayer. Update: I was able to put this into practice this week when my two year old was throwing his guts up and I was up all night and doing loads of laundry during the day. BOOM! Take that Satan – I offered it up for the newly ordained priests. Update on the update: I made a little calendar of categories of intentions to offer up every day. Hope it works! I hope you enjoy what you read! That it will inspire you and draw you deeper into the depths of the heart of God.